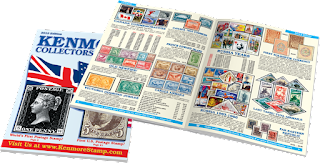 Do you want to get your kids or grandkids started in stamp collecting? Sign up to get a Free Kenmore Stamp Sampler, $5 Gift Certificate and 96-page catalog. The catalog features thousand of historic U.S. stamps plus interesting stamps from around the world. Request your starter kit at https://www.kenmorestamp.com/free-catalog-request.